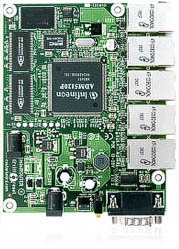 The miniROUTER (Mikrotik RouterBOARD 150) with 175MHz MIPS CPU, 32MB RAM, 5 10/100 ethernet ports, 64MB NAND with RouterOS L4. This makes a great Small Office or Home Router/Firewall. EOL (End of Life) This has been replaced by the RB/450 and is also available fully assembled in a case with power supply as the RB/450-complete. RB711-2Hn Mikrotik RouterBOARD 711 with Atheros AR7240 400MHz CPU, 32MB DDR RAM, 2.4GHz 500mW 802.11b+g/n radio, and RouterOS L3 - New!